FOR our fifth Modelling Special, Ray Rimell focuses on the 1:32 scale Wingnut Wings Sopwith Camels in a comprehensive meld of modelling know-how, rare archive material, colour close-up details and all-new colour profiles. 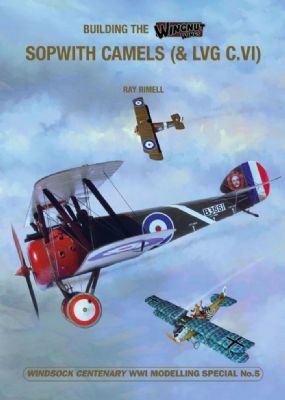 Liberally illustrated with over 320 images, this 62 page modellers' guide carries extensive build logs of the Sopwith F.1 Clerget-powered Camel and Bentley-engined 2F.1 'Ship's Camel' as well as 'bonus' coverage of the LVG C.VI paired with one of the Camel kits for the third Wingnut Duellists set. The models are treated to hyper-detailed step-by-step treatment with full photo coverage supported by detail close-ups in colour, along with contemporary wartime photos and drawings to provide a unique insight into every aspect: cockpits; armament; internal details, engines, finishing and rigging. The author takes the reader through the entire building process from initial pre-painting through to the final addition of wooden airscrews, offering experienced guidance on painting and decal techniques, adding detail inside and out, and all supported by carefully selected images to illustrate each and every stage of the builds. Other sections cover the various rotary engines that powered this classic British fighter, how the Camel got its name, and the daring Tondern raid when Camels flown from HMS Furious destroyed two Zeppelins in their sheds. All this together with a comprehensive bibliography and Jargon-buster as well as listings of relevant accessories and crew figures. Densely- packed with top notch material, including fresh insights into the IWM Camel flown by Lt. Stuart Douglas Culley, accurate reproduction of the distinctive British RAFwire rigging and guidance in achieving authentic-looking camouflage finishes, this Special features over two dozen archive photos,173 model photos and more than 100 close-ups of preserved aircraft in the UK and New Zealand. Whilst the book is aimed at modellers building the Wingnut Wings kits, it will have a broader appeal for those working in all the popular scales since much of the content is pure documentation providing a rich, informed and in-depth resource for these iconic WWI warriors.